...free paint samples! I was looking forward to a full day in the studio all week but instead was flat out on the couch with a migrain all day :( When I did manage to crawl off the couch & check the mail I was very pleasantly surprised to find a unsolicited package from Gamblin in my mail box. 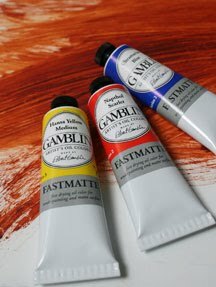 I thought they had sent me two samples in error but much to my delight they sent me a little additional treat of FastMatte paints and a couple small bottles of Galkyd Lite! I just used their image as still too sick to bother with the camera (or paint, sigh) but am quite excited to try these new paints for an underpainting. They sent me Transparent Earth Red, Ultramarine Blue and Titanium white. I hope to do an underpainting with these shortly as their fast drying times will allow me to glaze over sooner than if I had used the regular gamblin oils. Forget the flowers, just give me paint! Migraines are not fun...but new, fee paint is! Ok this is too coo. I recently switched to gamblin and love it. I even posted about my new toys! Have fun painting! I know, hard to focus on anything else with all these new paints ;) I checked out your new toys too, love the palette box!